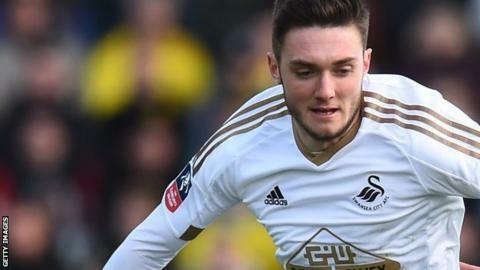 Blackburn Rovers have signed midfielder Matt Grimes from Premier League side Swansea on a three-month loan deal. The 20-year-old has played seven games for the Swans since making his £1.75m move to the Liberty Stadium from League Two Exeter City in January 2015. Grimes made his only Premier League start to date in September, having scored his first Swansea goal in the League Cup a month earlier. His last appearance came in their 3-2 FA Cup exit against League Two Oxford.